a simple, cost-saving and eco-friendly packaging solution! Smiflexi automatic packers of SK series (shrinkwrappers machine) and WP series (wrap- around casepackers) are now available in a special version, called XL (eXtra Large), capable of packing a large range of containers both in standard size cases and trays and in maxi trays - measuring ¼ europallet (400x600 mm) and ½ europallet (600x800 mm) - known as pallet displays. The XL version of Smiflexi packers meets new demands from large-scale retail trade for bigger and bigger packs capable of containing a higher number of products, in order to facilitate storage operations and positioning of each single container on the shelves of points of sales and supermarkets, ensuring remarkable economic and logistic advantages. trayloader, that inserts products into large pallet display trays. trayformer, that packs a high number of products into trays whose size is equal to 1/4 and 1/2 europallet. Moreover, pallet display trays are fully compatible with APS palletising systems of Smipal division; the combination of these technologies allows users to dramatically reduce production costs, thanks to the deep integration of secondary and tertiary packaging operations. remarkable savings in terms of TCO (Total Cost of Ownership) of the bottling and packaging line during its whole life cycle. 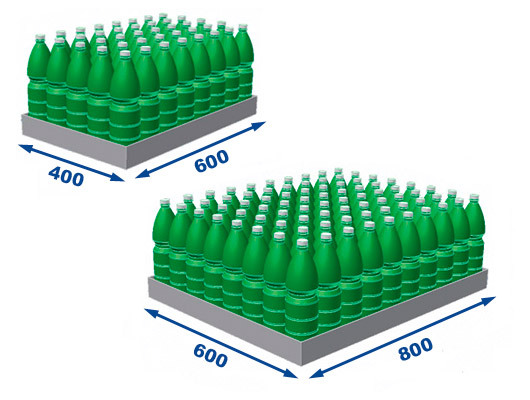 enhanced top-load level: pallet display trays produced by Smiflexi packers are made through a wrap-around system and, therefore, are more compact than those produced by old-style trayformers; this solution entails an increase in the top-load value of each product, thus allowing pallets with an additional layer in comparison with traditional solutions. If you need further information about pallet display trays produced by SMI automatic packers, please feel free to get in contact with our Sales Department.